Vernon Fountain, a U.S. Army veteran, talks with Katie Martin of DNB First Bank Dec. 13 at Operating Base Cecilia in Coatesville. Catholic Social Services and Veterans Multi-Service Center partner to assist veterans in securing housing and other benefits. For many veterans, coming “home for the holidays” is simply a line from a popular Christmas song. That’s because on any given night, an estimated 39,000 veterans are homeless, according to the U.S. Department of Housing and Urban Development. Since October 2013, Catholic Social Services of the Archdiocese of Philadelphia (CSS) has sought to eliminate homelessness among veterans through a partnership with the Veterans Multi-Service Center (VMC). 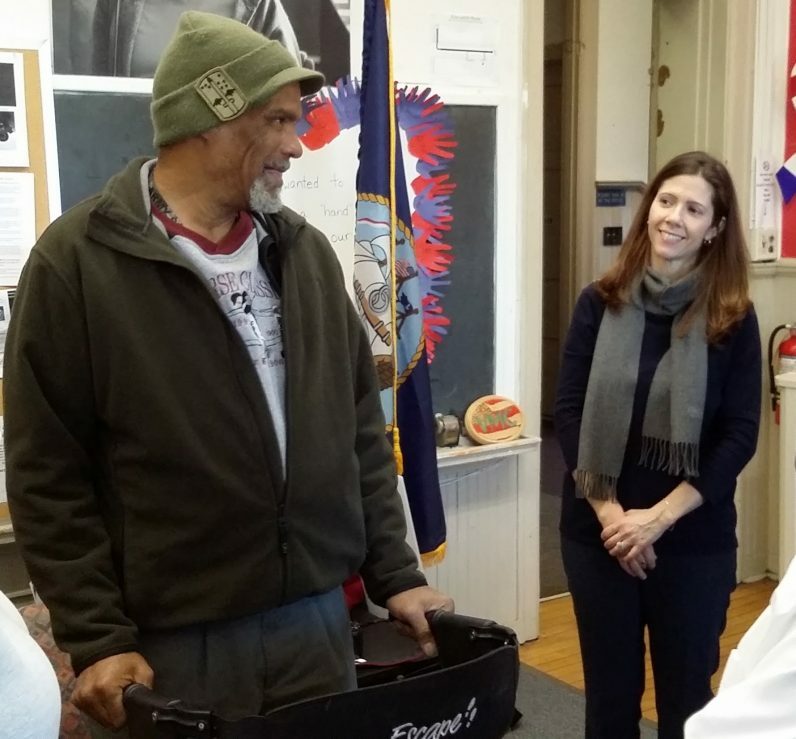 Working out of the former St. Cecilia School in Coatesville, CSS and the VMC offer a range of supportive services including homeless outreach, food and clothing assistance, Veterans Administration benefits counseling, and life skills courses. Nicknamed “Operating Base Cecilia,” the non-residential center assisted over 200 homeless veterans in Chester, Delaware, Bucks and Montgomery Counties during the past year. On Dec. 13 the team at Operating Base Cecilia received a Christmas present in the form of a $3,000 donation from DNB First Bank in Downingtown. The bank pledged $100 to the center for every mortgage application it processed throughout the month of November. Vince Liuzzi, DNB First’s executive vice president and chief banking officer, said that honoring veterans is a priority for him. Liuzzi, who is also a member of the CSS board of directors, hopes to reduce veteran homelessness through his bank’s mortgage initiatives. “With veteran loan programs, we try to create opportunities for people of service, who have given of themselves so selflessly, an opportunity to enjoy the dream of home ownership,” he said. Geoffrey Hurnyak, the VMC program manager and a veteran himself, notes that military experience — which instills self-sufficiency and self-sacrifice — can make it difficult for veterans to seek assistance. Hurnyak, who completed three tours of duty in Iraq, directs his team to reach out to veterans living in makeshift encampments. The main hallway of Operating Base Cecilia displays messages of thanks from veterans who have benefited from the center’s services. The cardboard signs, which recall those used by homeless veterans to solicit aid, are part of the VMC’s “Rewrite the Cardboard” campaign, an effort launched in 2014 to raise awareness of veteran homelessness. Hurnyak credits Catholic Social Services with enhancing the effectiveness of the VMC’s mission. 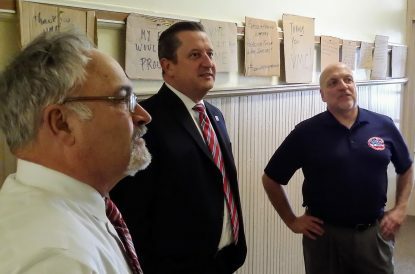 The VMC subcontracts activities such as case management to Catholic Social Services staff, who work under the direction of Rick Pytlewski, CSS administrator for Chester and Delaware counties. Karieff Smith, an outreach specialist at Operating Base Cecilia, feels that the VMC and CSS personnel blend seamlessly. Katie Martin, DNB’s First’s marketing manager, agrees that strategic partnerships can deliver enhanced results. “Any time that you can help people in need, and you can work together, you can always achieve more than by working alone,” said Martin, who created the bank’s veteran donation campaign. Vernon Fountain, an army veteran who served throughout the U.S., Europe and Korea, appreciates the combined effort of the VMC and CSS teams at Operating Base Cecilia.